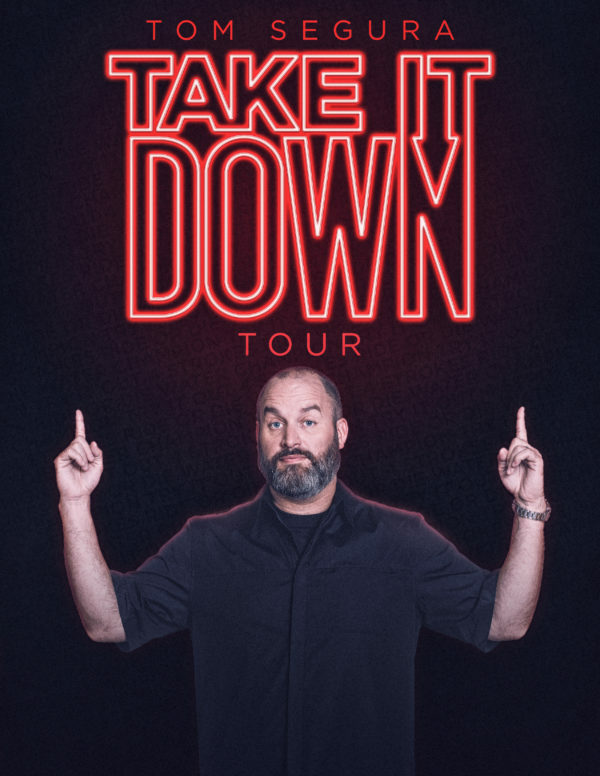 Actor/Comedian/Writer Tom Segura has quickly become one of Hollywood’s most in demand and highly regarded talents. He is best known for his three Netflix specials, Disgraceful (2018), Mostly Stories(2016), and Completely Normal(2014).Paste Magazine described him as, “…having a natural and capable storytelling ability, one that lifts his narratives out of average anecdote fare and plants them firmly in hilarious ground.” Additionally, his hit podcast Your Mom’s Housewhich he co-hosts with his wife, comedian Christina Pazsitzky, was a finalist for Best Comedy Podcast at the Stitcher Awards and profiled by VICE.Segura can be seen next in the Paramount featureInstant Familyopposite Mark Wahlberg and Rose Byrne premieringNovember 16thnationwide.Segura’s television credits include The Late Show with Stephen Colbert, Conan, Workaholics,Happy Endings, The Late Late Show,Comedy Central Presents: Tom Segura,Mash Up,How To Be A Grown Up. Segura has risen to be one of the top comedy theater acts in the country. He also continues to perform at the top comedy festivals in the world, including Montreal’s Just For Laughs Comedy Festival, The Melbourne International Comedy Festival, The Comedy Festival -Las Vegas, The South Beach Comedy Festival, and The Hong Kong Comedy Festival. Segura has an increasing social media following (@seguratom on IG)and also regularly appears on radio shows like the Bennington Show and some of the most downloaded podcasts in the world of comedy such as The Joe Rogan Experienceand WTF With Marc Maron among others. His fourth hour-long stand up album Mostly Storiessat atop the iTunes and Billboard Comedy charts for consecutive weeks and his first two albums Thrilledand White Girls with Cornrows debuted at number 1 and continue to play heavily on satellite radio and streaming music platforms. When he isn’t performing on stage or recording a podcast he’s watching College Football or waiting for College Football to come back.Segura is originally from Cincinnati, Ohio and currently lives in Los Angeles. A $5.00 theatre restoration fee and a convenience fee are applied to all ticket purchases. In addition, a $4.50 processing fee will also apply. In person, telephone or shipping purchases incur additional fees.